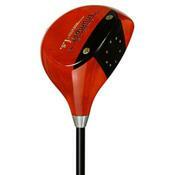 I Had been wanting to get this driver for a while, and recently went to the Louisville Golf plant to pick one up. It's impossible to overstate just how "Red" this driver is. You can see it a mile away, and I get a lot of 2nd and 3rd looks from other golfers. Here are the pros and cons I've learned in the 2 months I've been using the FS.